Advanced’s products lead the market in performance, quality and ease-of-use and the company has been at the forefront of standards leadership for decades across many of the 80 countries it operates in. 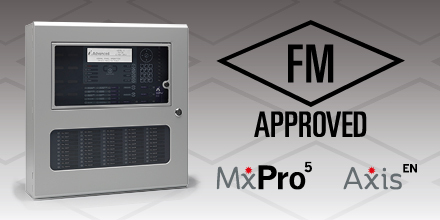 As well as holding FM Approval for EN54 Parts 2 & 4, the Axis EN and MxPro 5 fire panels were among the first to obtain EN54 Part 13 from VdS. The FM Approval of Advanced’s fire panels also included an inspection of Advanced’s manufacturing sites as it moves into its state-of-the-art HQ in Newcastle in the North East of England. The MxPro 5 and Axis EN labels and branding are being updated with the FM certification in early 2019. The MxPro 5 multi-protocol panel and Axis EN systems panel are certified to EN54 Parts 2, 4 & 13 and come in one-to-eight-loop variants as standard, with further custom build options available. Both product ranges are easily configured into high speed, 200-panel networks, covering huge areas with tens of thousands of field devices. They include high performance features such as Advanced’s complete false alarm reduction software, AlarmCalm, and TouchControl, Advanced’s control and touchscreen repeaters that feature Active Maps and zone plans. Advanced are specified from the smallest to the largest buildings globally including in some of the most prestigious developments such as; The Shard in London, Abu Dhabi’s International Airport and Istanbul’s Hagia Sophia. 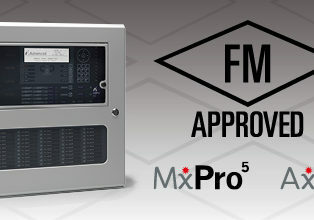 FM Approvals is an international leader in third-party testing and certification services for property loss prevention products and services for use in commercial and industrial facilities to verify they meet rigorous loss prevention standards of quality, technical integrity and performance. FM Approvals employs a worldwide certification process that is backed by scientific research and testing, and over a century of experience. The FM APPROVED mark is recognised and respected worldwide.